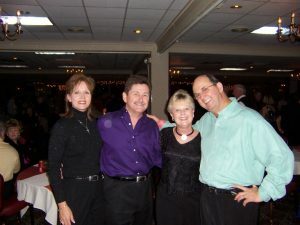 Don Bunn was inducted into the National Living Legends of Dance in a ceremony November 2004, at the Little Creek Naval Base, Virginia Beach, VA. Don joined 19 other dancers from North Carolina, South Carolina, Virginia, Florida, New York and Texas in receiving this prestigious award. AC Williams, good friend of Don and Shag Instructor in Fayetteville (Teaches Shag along with wife Cathy who was inducted in 2006), and good friend, Kathryn Monsour of Fayetteville, were also inducted the same weekend. The National Living Legends of Dance is an organization that recognizes dancers from all over the country, not only for their dancing ability, but also for their other contributions to betterment of dancing. The process to be selected into the National Living Legends requires the selection committee to accept a recommendation from someone of a person; then the person must receive a formal nomination. After being nominated the candidate must be voted into the National Living Legends of Dance by the selection committee. Once voted into the organization the person is sent a VIP invitation to attend the induction ceremony where they are officially inducted. The National Living Legends of Dance weekend is all about dancing and the induction ceremony. The first night is party night complete with Music and Gourmet Breakfast Buffet. The party atmosphere continues Saturday afternoon and Saturday evening with a lunch buffet, music and dancing. The dancing is interrupted only long enough on Saturday night for the induction ceremony and then the music is cranked up again. This is a fun weekend. Many Raleigh Shag Club members attended the event including Debbie Peterson and members of the Shag Class Dance Team, Jimmy Dickens and Sandra Price, John and Susan Leggett. Don wants to give his special thank you to those from Raleigh that attended the ceremony and to his friends from Fayetteville that were there and supported him during the ceremony. Also, thank you to Berta Lull, Chairman of the National Living Legends of Dance and to others on the committee that supported Don’s nomination.